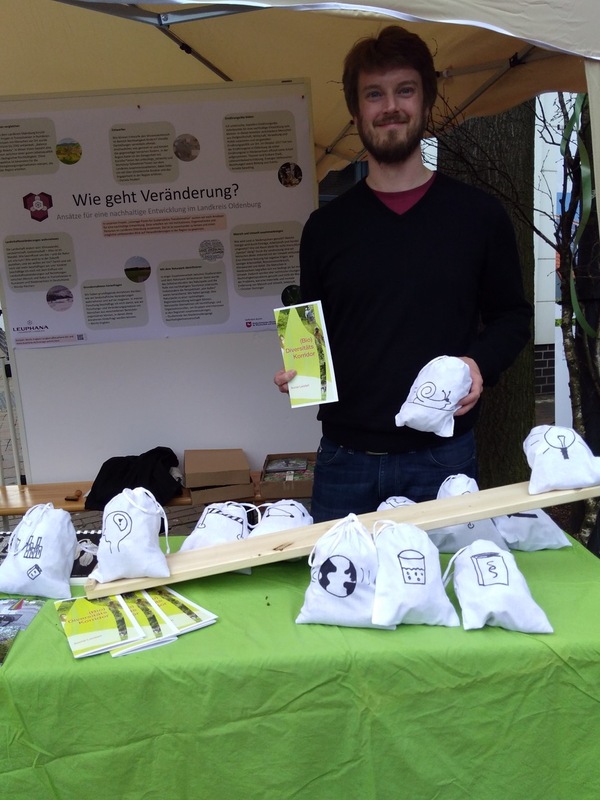 The climate fair is part of a festival in Wildeshausen that takes place in spring. Initiatives, non-governmental organizations or companies present their work. As last year, we from the Leverage Points project and the artecology_network had a stand together. From the artecology_network three projects were present: Anja Schöller offered food that was made of neophytes (recently introduced non-native plants) in order to “eat them up instead of destroying them with pesticides”. Michael and Brigitte presented their project “Restleben” in which they motivated passengers to reflect on their everyday practices of doing and not-doing. 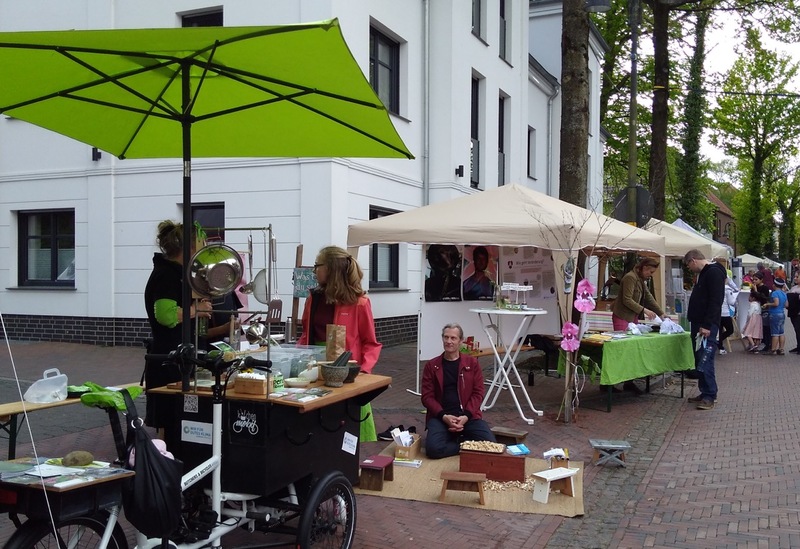 Jaana Prüss and her daughter presented the kitchen mobile, an e-bike with a kitchen that makes it possible to ride around and cook regional plants with people in the district. I presented a poster on “Wie geht Veränderung?” (How can change happen?) (Poster) on which some of our activities and research results in the Oldenburg region were described. Furthermore, I built an interactive model of the leverage points concept by Donella Meadows in order to make the concept more understandable for a broader audience. Also thanks to the weather the climate fair went very well. There were three things that especially stood out for me that weekend: First, it is really helpful to have a model people can interact with. Often kids were attracted to play with the model so that I could discuss with their parents later on. Second, over the weekend I met a lot of elderly people (80+) that were strongly concerned about the future, especially when they talked about their observations of nature like a strong decrease in bees and other insects. Their stories left an impression on me. Third, a lot of discussions went around the gap between knowing about worldwide problems and sustainability issues and acting accordingly. For me, this issue is strongly related to cultural and social dimensions of change and sustainability. At least it helps me to understand that changing thinking and acting is especially hard because it is based on many matters of course that we implicitly identify with and on which our (individual and collective) visions for the future are based. It made me especially think about how the deep leverage points are related with each other. In May and June there will be several events in the (bio) diversity corridor that you can find on this flyer (Flyer ).